It’s been years since I’ve deliberately gone through family photos. 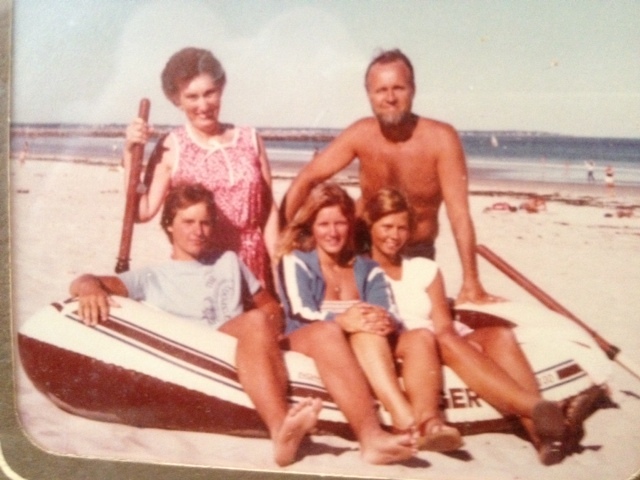 There were years after Cindy’s death when we never even took any family photos. We were always a real “photo taking” family, lots of photo albums and scrapbooks. Rarely was there an outing or occasion where a camera was not present. My father was always very good at memorializing all our fun times with picture taking whether we wanted it or not (teenagers). This ceased for probably nearly a decade after Cindy was killed. I imagine that’s not too uncommon for surviving families. It’s one thing to have to feel that void in the architecture of your family but another altogether to have to see it, much less document it. No one talked about how we’d stopped taking photos, it just happened. I remember distinctly several years ago noticing we’d started taking pictures again. It took a long time. 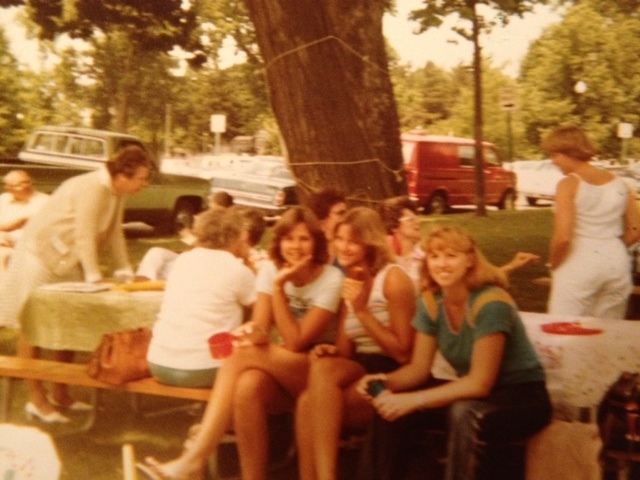 One thing that struck me while looking at so many old pictures of my own and John’s recently, was just how physically close Cindy and I always were. Generally if we were in a photo together, we were side by side, often touching. This is very descriptive of our relationship. People often asked if we were twins although we really didn’t look alike and had completely different body types-she tall and lean, me average height and, well, not lean. I remember my Grandma telling a story often of how Cindy reacted when I was brought home from the hospital. 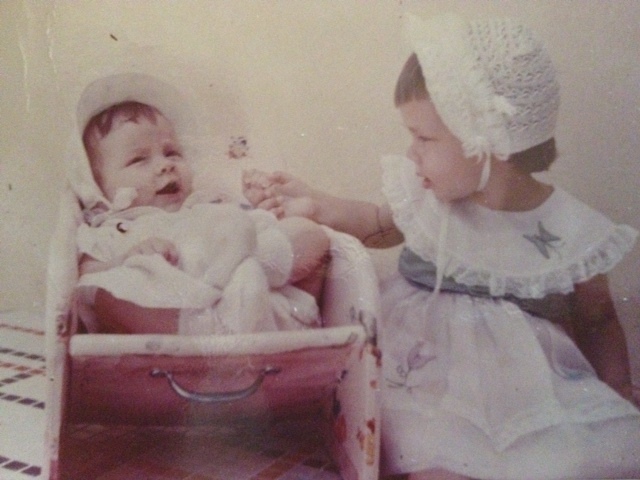 She shared “Cindy would parade you around telling everyone ‘this is my baby!’“. She would tell us often about how we were always close. 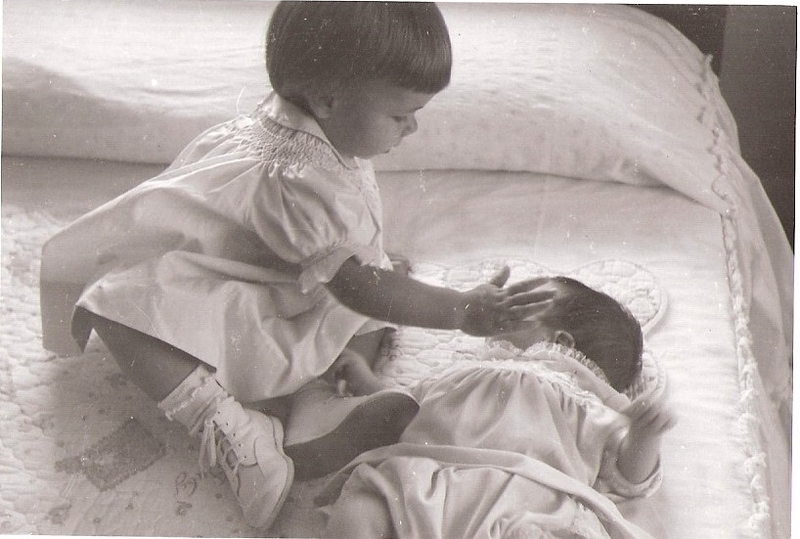 We rarely had any typical sibling rivalry, that Cindy was thrilled to have a new sister vs what first borns often go through. I’m not saying we never had conflict. There was a period in high school when she bullied me with her friends one night on a sleepover. They wrapped themselves in toilet paper and paraded around my bed while I was sleeping chanting “Fatty Kathy Fatty Kathy Fatty Kathy”. I remember being devastated but at the same time, not being mad because I knew she was just trying to impress her friends. Besides that, I wasn’t fat. She was just trying to push some kind of button. We laughed about this many years later. 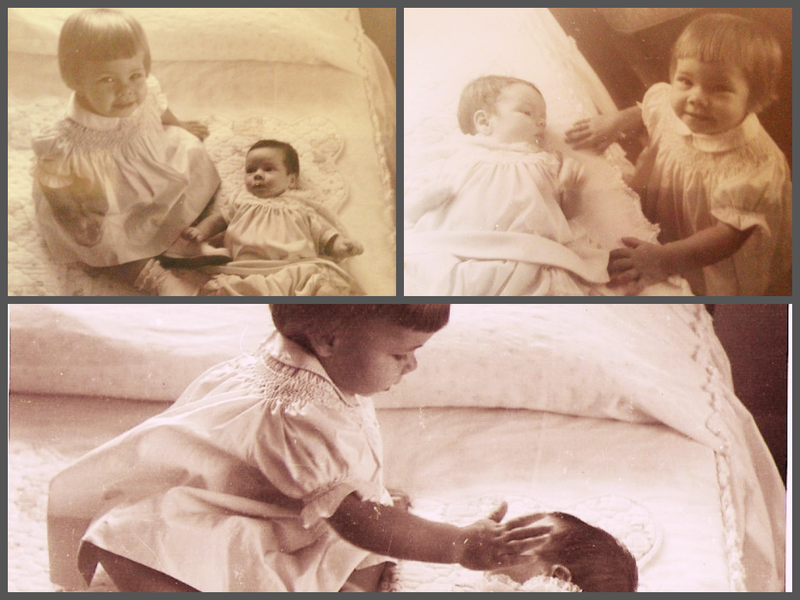 As I look at these childhood photos, I can see physically how strong that bond was formed. Cindy always set the tone. She was a very social person so once I came along it was like she had an instant friend, an instant dress up doll, an instant cheerleader, an instant fan who would basically go along with anything she created. She was the leader and I gladly followed along. Always. 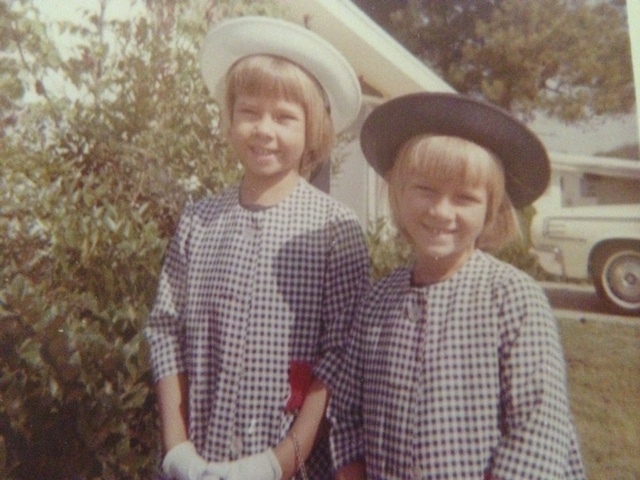 I know our mother had so much fun dressing us up identically like two little dolls. There just was never much space between us. 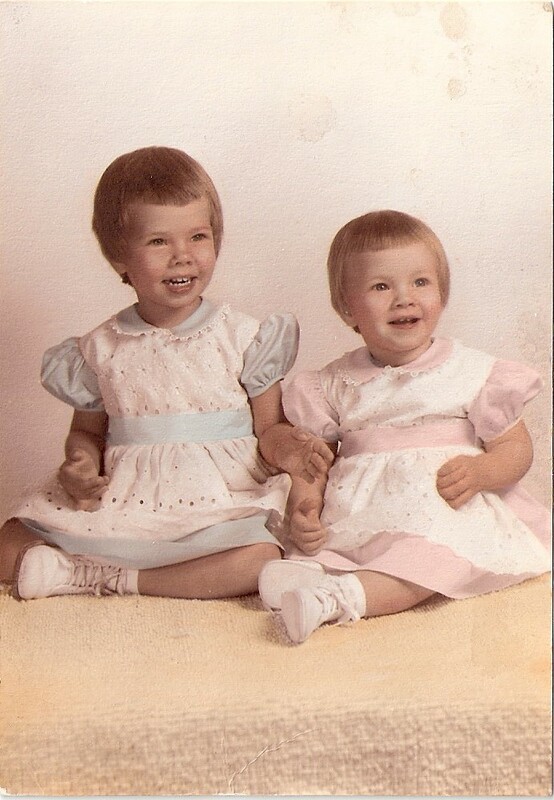 I still have both these dresses from this photo. Mine pink, Cindy’s blue. I look at this picture and I know instantly it was taken around the time we lost our “Mommie” as we called her and how she spelled it. Or maybe around the time she was sick and in the hospital. 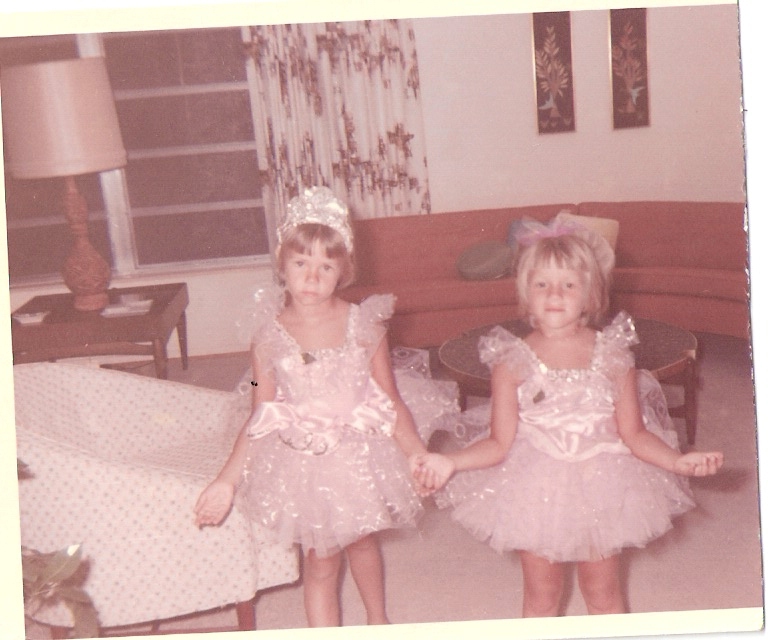 I know we were showered with gifts at that time including these little ballerina outfits. Our pain is washed all over our faces. Even with a camera pointed at us, we couldn’t find our smiles. My posture just looks so crushed. We survived together. We huddled together for safety and warmth and we drew an invisible line around our union that was rarely penetrable. I feel sad for my brother when I think of his isolation in our family. It was pure survival and I think we did very well, all things considered. This is a blurry picture but it’s what inspired this post. Cindy and I often sat together like this. So close it was almost like we were sitting on each other’s lap. I remember feeling so safe in her sphere, always. In our 20’s we did a lot of partying, of course. We started noticing a pattern, that whenever we were together, we attracted men like flies unlike any other time we went out with friends. There was something so unique and so magnetic about our dynamic that two of our good friends labeled it “The Monkman Sisters Syndrome”. We could be covered in salt and wild hair with no makeup or in any way “dolled up” after a day at the beach and men would be falling over themselves to buy us a drink. That almost never happened when we weren’t together. I’ve not ever found that dynamic again. When I think about it, I think it was that we didn’t really care if anyone approached us because we were having such a good time together. We had our own language, our own nicknames, our own jokes and we were completely entertained. We had a hard time finding boyfriends actually because no one really was as interesting to us as us. We would find ourselves describing a new man to each other with phrases like “he’s just like YOU..” in one way or another. This was a family Christmas picture in probably around 1980 or so. Again you can see how I’m practically in her lap. The Christmas before Cindy was killed, she insisted we take this “family photo” together. It was all her idea. She even wrote a little letter to go along with it. We handed them out and gave them to our friends. 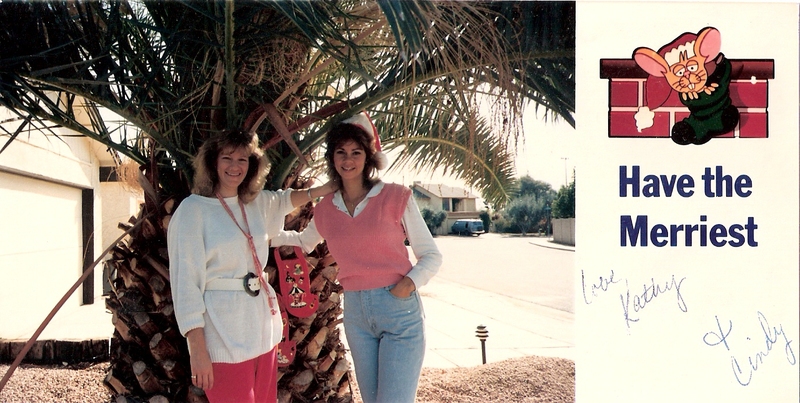 She showed up one morning with a friend to take the picture and we just walked in to my front yard and stuck our childhood Christmas stockings to the palm tree and snapped it. I’m so glad and so sad that she did this. As you can imagine Christmas has never been the same since 1988. We’ve rarely taken another Christmas picture as a family again. It’s a breakthrough of sorts for me that I can even look at these pictures, much less share them. It’s taken over two decades but I’m finding ways to still feel that closeness even if it’s through a memory. Or now as I’m seeking guidance and signs. I know that I’m lucky to ever in my life have had this kind of connection. Many people go through their whole lives never finding anything remotely like this with another human being. It’s hard to feel lucky sometimes though when you also feel haunted with this memory. Nothing ever replaces growing old with your soulmate. Nothing. Your blog has moved me like no other I have been on. It is heart wrenching and cathartic at the same time. Thank you so much for sharing your heart. I’m so happy you are healing through this process. That describes how I’m feeling writing it Rae Rae. thank you for sharing. ❤ I'm glad it's moving you. You are also color coordinated. She has on a pink vest and you have your slacks. Sweet picture. As you work through this next phase of your recovery, you will be able to look at these pictures with a sweet smile and memory. The tears come first, but will dry and the warmth in your soul will take over. You will always miss her, but will treasure the time you did have with her. Some people never experience this type of bond. A blessing for sure. Kathy, your writings have touched my heart. 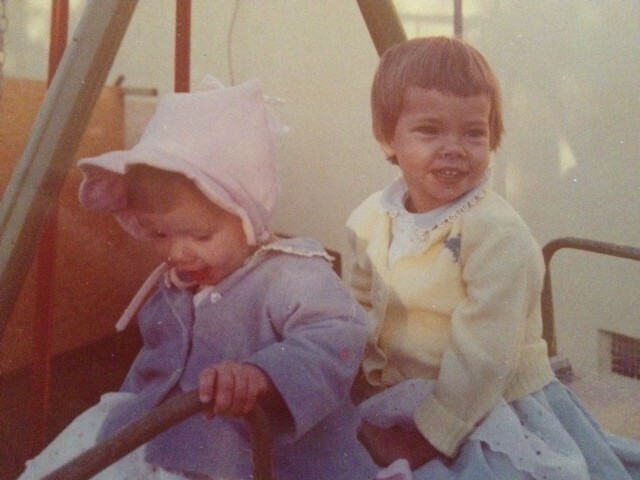 My sister is three years younger than me, and thankfully we are growing old together. At least, we have reached middle age. My mom died when I was ten, so we have always taken care of each other. Reading your blog has reinforced for me how truly blessed I am! Thank you. I pray that God comforts you. What a fantastic sister you are! I am so very proud to call you my faraway-friend. From my heart to yours, may you be blessed with a sunshine smile. Absolutely sweet pictures! Seems like you are truly being blessed with such wonderful, healing epiphanies — enjoy. Beautiful pictures! What 3 beautiful kids on that boat! Just gorgeous inside and out…and Look at Dads proud face. I want to hug dad. 🙂 I see a beautiful book sprouting. What an inspiring one it will be. I love your stories. I hope telling them is helping you to heal and move forward. Your thoughts about not taking or wanting to look at family photos after the death of a loved one hit home for me. I always took photos and displayed them everywhere. I, too, am starting to look again 6 years after a loss. Thanks for expressing it so well as I thought I was the only one that felt this way. I’m at a loss for words because your words say everything. At the risk of redundancy, you are the most AMAZING girl I’ve met in cyberspace. So much that you’ve experienced in life just makes me ‘Speechless’!!! I know many have a different opinion of Michael Jackson than I do and I’m comfortable with all opinions. For me, he always brought me closer to God. Please accept this beautiful song in the manner that I share it with you. You and Cindy are the same ages as my sister and I. Another thing we have in common. Kathy, this is so touching I don’t even know what else to say. That you share your story publicly feels brave (and oh so much more) and cathartic for you. I’ve just started following your blog and though I started from the beginning this is my first comment. May you continue to feel blessed by all the love surrounding you….always …..